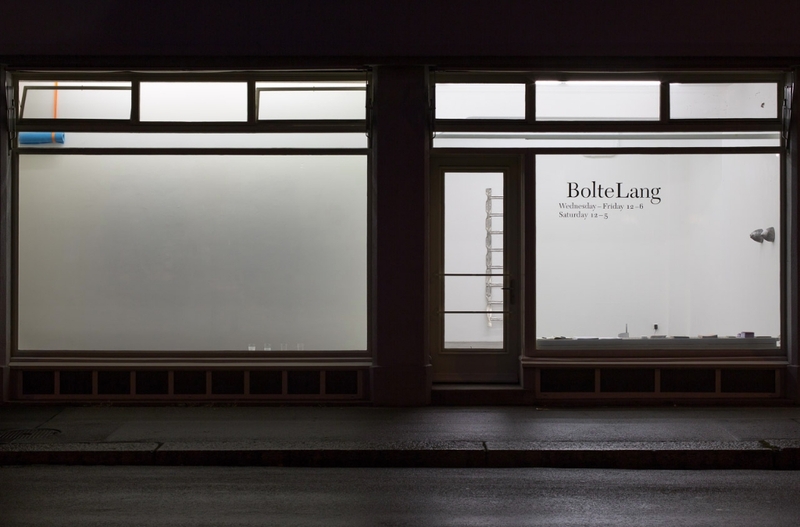 Clean Cold Fire is Vanessa Billy’s third solo exhibition at BolteLang and builds on her recent show Dear energy with Sommer & Kohl in Berlin, which addressed energy in all its forms. The continuation of these ideas circles around Billy’s ambiguous comment on our high-energy consumption today and its widely discussed and problematic production. The centrepiece of the show is an especially conceived installation titled Smells like electricity (rampant), a trail of cables and internet wires running along the gallery floor, sporadically covered with pieces of poured asphalt on top of which the artist places various natural and processed materials. It comments in equal ways on the visibility and hidden nature of her topic. The asphalt stands in for the streets that divide us from all the cables and tubes that make our daily life possibly, whereas the organic materials signify the potential for new energy. The combination of asphalt and wire also makes a strong comment on the paradox of matter and information. While the ordering of a product over the internet only needs a finger click, it still takes a lot of energy and physical matter such as man power, streets, cars, etc. to get the product to its user. Looking at Vanessa Billy’s installation it suddenly becomes visually apparent that energy is absolutely everywhere, sometimes visible and sometimes not. Here the work strongly connects to Billy’s sculptural practice where the juxtaposition of opposites and highlighting of the absent has made the artist her name. The second work in the show is called Refresh, Refresh!, and consists of two lemons cast in aluminium. The title is a clear reference to internet culture. At the same time the material and production of the work also references a number of environmental issues close to the artist’s heart: waste, recycling, and again our high energy consumption. The interplay between title and object is typical for Vanessa Billy’s practice where the titles are an integral part of her collages and sculptures. Vanessa Billy (born 1978 in Geneva) has had solo exhibitions at Sommer & Kohl, Berlin (2013); Piano Nobile, Geneva, (2013); Frame, Frieze Art Fair, New York, with BolteLang (2012); unosolo project room, Milan (2011); Kunsthaus Baselland, Muttenz (2011); Project Space, The Photographer’s Gallery, London (2009), and has been part of numerous group exhibitions, such La Jeunesse est un Art, Aargauer Kunsthaus, Aarau (2012); Art and the City, Zurich (2012); Manufacture, Centre Pasqu’Art, Biel (2012); Keep floors and passages clear, White Columns, New York (2011); Young people visit our ruins and see nothing but style, curated by FormContent, GAM Galleria Civica d’Arte Moderna e Contemporanea, Turin (2009); Frieze Sculpture Park, curated by David Thorp, London (2009); Boule to Braid, curated by Richard Wentworth, Lisson Gallery, London (2009); Timewarp, curated by Felicity Lunn, CRAC Alsace, Altkirch (2009). In 2014 she will have a solo show at Limoncello, London (UK).